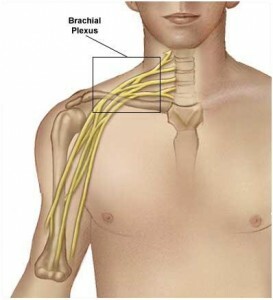 The brachial plexus is the network of nerves that controls the movements and sensation of the entire arm and hand. The nerves connect the hand with the brain and the spinal cord. At the point where the nerves exit the spinal cord they divide and rejoin to form the network known as the “brachial plexus”. If there is damage to the brachial plexus this can cause problems with the ability to move the arm and hand and to feel the arm and hand. Damage to the plexus can occur during the birth process in babies. 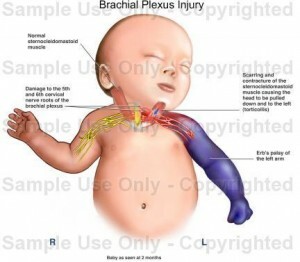 This is known and Brachial Plexus Birth Palsy. When it occurs a babies arm will be held in abnormal positions or even be flaccid and unmoving. Dr Harvey coordinates the only paediatric brachial plexus clinic in South Australia at the Women’s and Children’s Hospital. Children are assessed by a multidisciplinary team including doctors, physiotherapists and hand therapists to ascertain which nerves are functioning and which are damaged. Dr Harvey has authored chapters in international medical text books and presented at international conferences on the assessment and reconstruction of children’s brachial plexus injuries. Injuries to the plexus in adults are most commonly the result of trauma from bicycles, cars and motorcycle accidents. Injury to the plexus can also result from cancers and therapy, other wounds and even radiation and viruses. The problems experienced by adults are similar to those experienced by children; inability to move the arm and hand in certain ways, loss of feeling in the arm and hand and also occasionally pain. When the injury to the brachial plexus is identified early it may be possible to rejoin the nerves to regain the function of the muscles in the arm and hand. Sometimes the nerves are so badly damaged that they cannot be rejoined, In this situation it may be possible to bridge the damaged area with nerve grafts or even to transfer a nerve that is not needed to an area where it will give great benefit. This procedure is known as nerve transfer. In the early phases post injury nerve transfer can give excellent results. Once the injury has been established for some time it may not be possible to get the existing muscles of the arm working again. In this situation of the “chronic” brachial plexus injury it may be possible to regain some of the movements of the hand and arm by muscle transfers. This is where the attachment of existing working muscles is altered to change their function. An example of this is changing the latissimus dorsi muscle attachment where it joins the humerus (Arm bnone). This muscle normally rotates the arm inwards bringing the hand towards the abdomen. If the attachment to the humerus is adjusted it can be made to turn the arm outwards away from the abdomen instead. It may even be possible to bring new muscle into the arm to regain lost functions. This is known as a free muscle transfer. At your appointment your arm, hand and limb function will be thoroughly assessed and any options suitable for your particular case will be discussed with you. The assessment of Brachial Plexus Injuries can take some time so please remember to ask for a long appointment when booking. You may be asked to complete tests or imaging to help determine the functional status of the remaining muscles and nerves. The need for any such tests will be discussed with you at the time of your appointment.